Posted on May 2, 2018 at 6:04 am. We begin today with WOLF PACK PRIDE!! Thanks to all the students and staff who got into the spirit of Spirit Week and dressed-up in their hippest duds from days gone by. You’re looking good on Decades Day, Williamsburg! 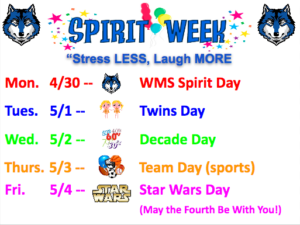 Now here’s the Spirit Week rundown for the rest of the week: Thursday is for all our sports fans with Favorite Team Day; and then on Friday, in honor of May the Fourth — it’s STAR WARS DAY!! So get into the school spirit, wolves, and BE A PART OF THE PRIDE!! And now as part of Spirit Week and our “Stress Less, Laugh More” initiative, we’d like to welcome a special guest to the WOLF-TV Studio. Say “hello” to Ms. Schaefer! SCHAEFER: Hello, Wolf Pack! It’s me, Ms. Schaefer, here from the Student Services Staff with today’s Mindful Moment. As you can see, I got into the spirit of Spririt Week today — do you like my blue eye shadow? But I’d actually like to talk about something serious. When people get anxious or stressed-out, their breathing tends to speed-up — which makes it HARDER to calm down. So this morning, we’re going to practice “Relaxed Breathing” — a simple technique that is slower and deeper than normal breathing, and can actually help to signal your body that it’s safe to relax. Let’s give it a try! First, make sure you’re sitting comfortably, and if you’d like you may close your eyes. Try to breath through your nose, and deliberately try to slow your breathing. Now breathe IN to a count of four — 1…2…3…4. Keep breathing just like that. Make sure your breaths are smooth, steady, and continuous. And pay particular attention to your “out” breath — keep it smooth and steady. Now open your eyes, stress less — and laugh MORE! Thanks for joining me in a round of Relaxed Breathing, and I encourage you practice this on your own. Have a great week, a be a part of the Pride!! For the past week or so, there’s been a lot of talk about “stranger things” going on in the woods around WMS. Well today — the mystery is REVEALED! Ladies and gentlemen: the Fairies are HERE!! OK, they’re not actually “real” fairies. But it is a FAIRY VILLAGE. Mr. Dudek’s and Mr. Skrzypek’s ACT 2 classes collaborated on this creative project — bringing a little “magic” to our otherwise “mundane” school. Students and staff are encouraged to explore the courtyard and other outdoor spaces around Williamsburg this Spring — and see if you can find all the magical doors and buildings that now dot our campus. Remember — the greatest inspiration can begin with the SMALLEST idea! Hooray for fairies!! All aboard! There’s a special “commuter” activity at WMS. TODAY from 10:15 to 1 o’clock, an ART bus will be parked outside of the main entrance. Students are invited to climb-on and explore this state-of-the-art bus, as well as purchase SmarTrip cards from the Mobile Commuter Store. Remember, students ride the ART bus for half price with an iRide card — and it’s a great way to get around. See Ms. Mays in the office with any questions. And now for an important announcement for all TAB Book Club members. If you’d like to participate in next week’s Skype with award winning author Stuart Gibbs, then your permission slips MUST be turned in by TOMORROW — AT THE LATEST. Again, without a signed permission slip, you will NOT be included in the Skype with Stuart Gibss. See Ms. Lord with any questions.